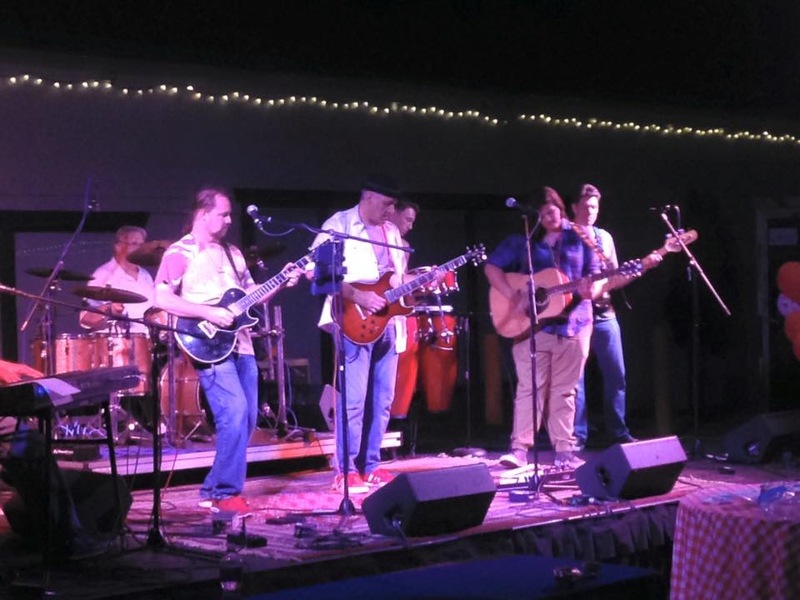 Working on your own material with a group of very talented musicians might seem nerve-racking. I can’t speak for other writers, but I always have apprehension when I bring up a new piece of material. Yet when you have a group of guys who are not just talented but wanting to hear your stuff and wanting to help you succeed there is something so very satisfying about that. 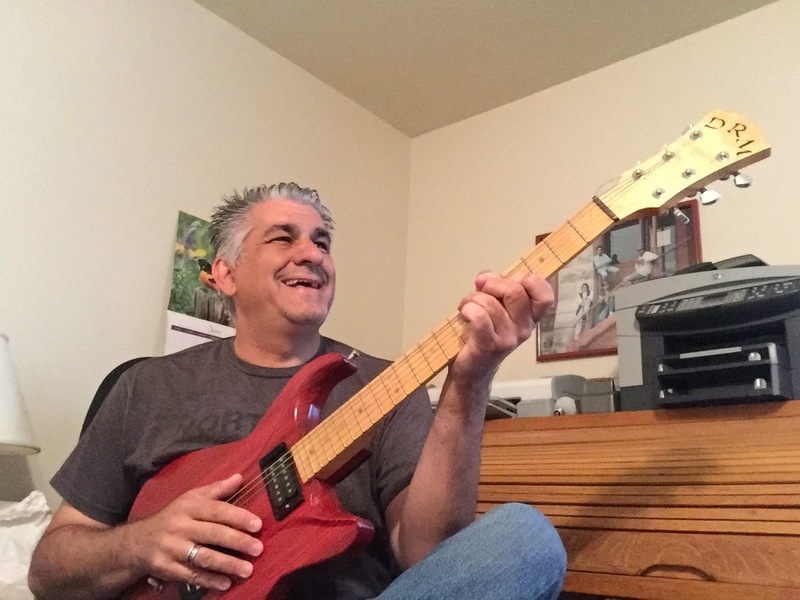 My goal in the first recording session is to have two songs recorded and completed. If there had been any fear that this wouldn’t happen I left those by the wayside after Friday’s rehearsal. 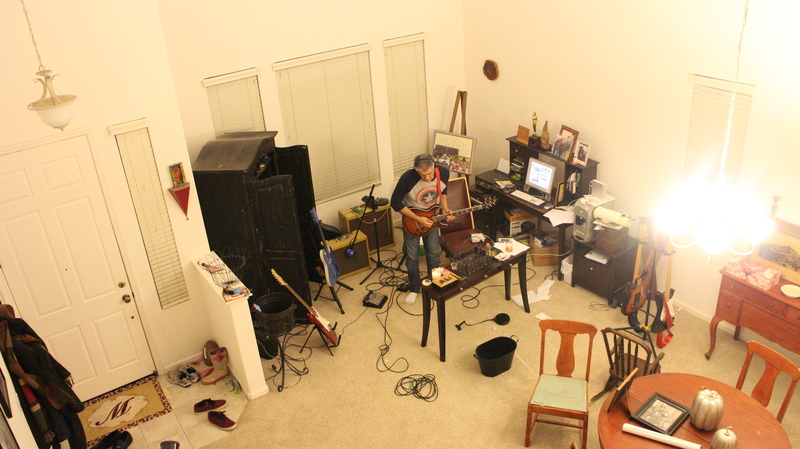 We started slowly, listening to the very bare demo and quickly put an arrangement together. Then we tweaked it, wrote out a bass line, put things together, took them apart . . . and then it just seemed to work. When we finished the arrangement came the harmonies, which just added even more life to the song. Something more than I could ever have hoped. This all came after visiting the studio, Pus Cavern studios, which is small but comfortable. It looks like the right kind of place for a group of guys working out harmonies in the drummer’s living room. Not that doing this in a living room detracts from the material. One of the best feelings is to have these guys say they like the songs and help me make the arrangements. One of the bad parts of having learned guitar by ear is the fact that I cannot easily write up anything about what we’re playing. It takes me awhile to even figure out what chords I’ve been playing by scrolling through reams of chord charts. 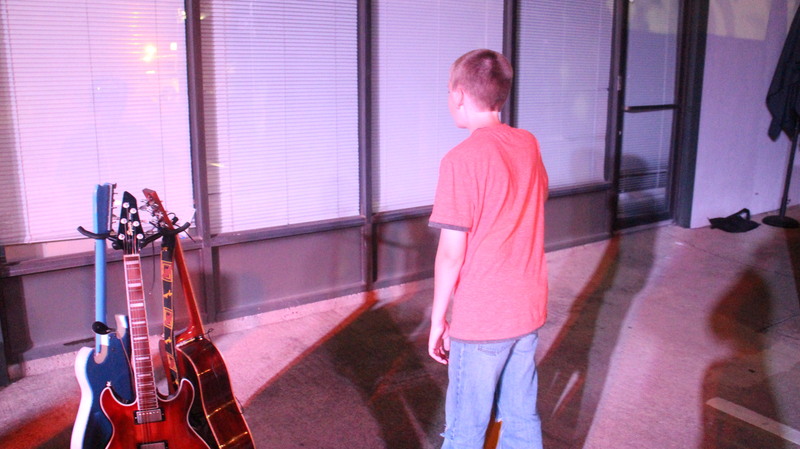 When you can touch a 16-year-old with your lyrics and music it’s a big deal, at least to me. That says the themes are pretty universal. It also says that the idea of finishing this and closing one door while opening another on my life is the right direction. What an amazing experience to work with such talented people. The songs take this raw form and turn into something so much bigger and livelier. What an amazing experience . . . and we haven’t even hit the studio yet. In what was my first live gig in a very high number of years I recruited a couple people to help me. They were, obviously, my children. It started before I ever hit the stage. 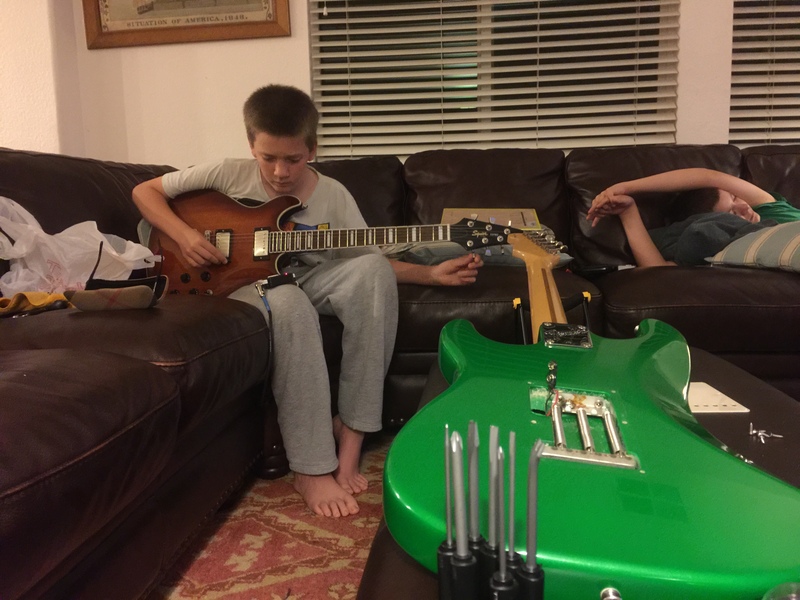 One of my twin boys is getting guitar lessons and has to practice tuning up his guitar so he asked to practice on the guitars I re-strung for my weekend gig. So as I worked on one Fender Stratocaster he tuned up the Fender Esprit I had just re-strung and polished. It was tuned to perfection. 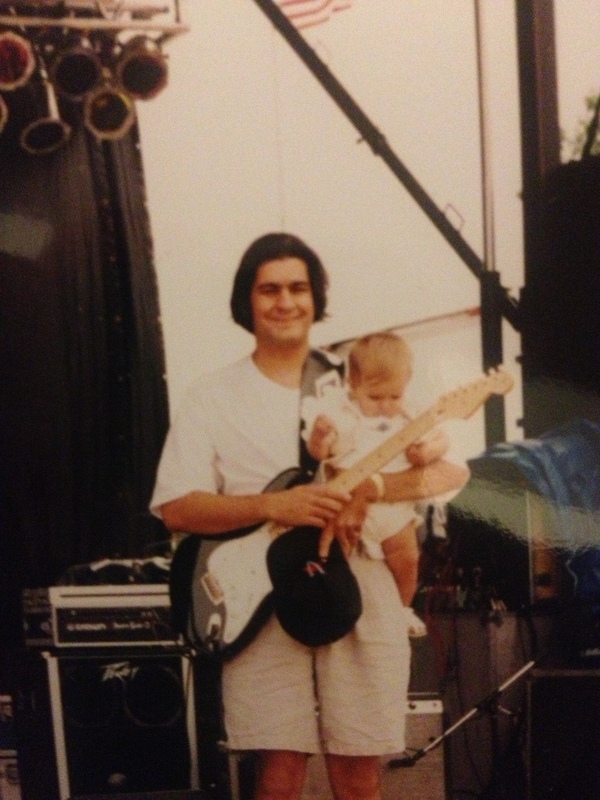 When the time came to hit the stage my son was my tech…handing me the myriad of guitars I switched from song to song. When I played Vaughan he handed me the SRV model. 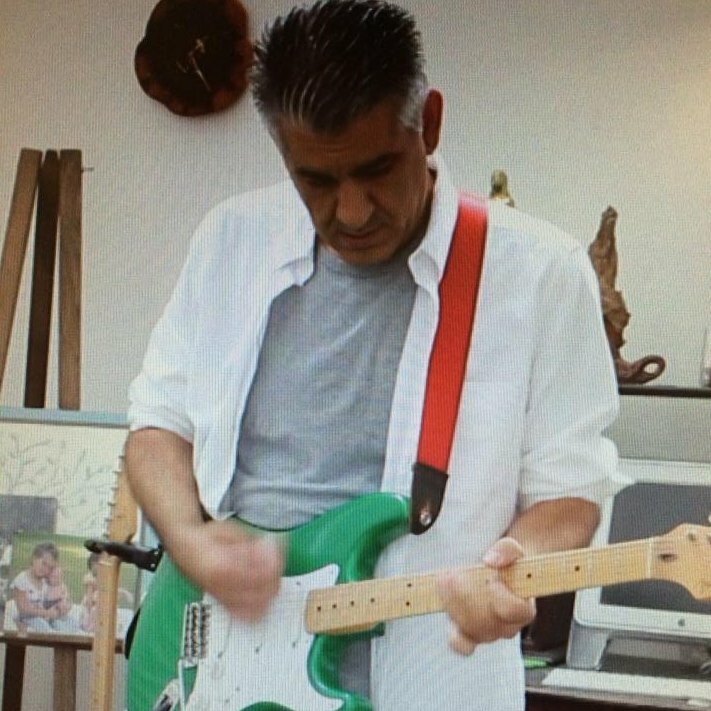 When I did Hendrix, my beloved green Strat. He knew their names, watched and listened. His brother listened from the audience and sang along with songs he knew. Midway through the show I brought their sister up and she played acoustic guitar on an Allman Brothers song we played. It was, after all, a family affair. While the gig was amazing . . . it wasn’t necessarily the performance – which I absolutely had a blast doing -that was the highest point. When our keyboard player, an amazing musician in his own right, told me how much fun it was to play together I had a bit of beaming pride. But the greatest moment was when my son gave us a compliment. That Allman Brothers song is one of the most complicated pieces we played. It had harmonized guitar lines that along with the acoustic guitar. While I thought we had more than a few hiccups my son ran up next to me as we were loading up our amplifiers and guitars at the end of the night beaming. “That sounded sooooo cool when you played Jessica,” he shouted. The harmonized lines, the live feel, the melodic tone was enough to have him bursting at the seams. Then to see his sister as part of it I think he began to see just what the possibilities were if you could play guitar with a group of people you admire, sure, but have deep friendship with as well. We didn’t rehearse as much as we should have but our playing was pretty spot-on. “You guys sounded so good,” said my daughter! As musicians, we tend to see only the flaws and want to improve on them. But sometimes it’s great to hear what others heard . . . the fresh ears that haven’t been there to hear your rehearsals and the clunky notes or broken strings. But more than that . . . I can’t help but be a little proud that I impressed my kids . . . even the teenage one . . . and showed them that you can still do some pretty cool things, even if you’re a Dad. It started tonight with Whitesnake. Wait, wait . . . stay with me! I know, it’s a hair band from the 1980’s and the embarrassed icon of all that is excess and every boy my age in that era was able to sing (badly) along with David Coverdale. Having tucked my sons into bed and cleaned up from the night’s culinary creation I sat down for the mere half hour or so of television I had available to me only to find that, with more than 500 channels, there was just nothing on TV. It was in scrolling through the guide on this weary evening that one channel had Whitesnake Live. My daughter looked up with a smile that I realized, having raised her this past 16 years, was trying to be sly but was, in fact, completely faked. I belted the next line out. “...and here I go again on my ooo-oh-own…. She had that look of cognition that was filled with both enlightenment and horror. So I played her a different song. In the 1990’s, when the world was itching for Zep to get back together, there seemed no hope. Then out of the blue, after Jimmy Page had made disparaging remarks about Whitesnake he joined up with David Coverdale. It was as close, at that time, as we’d ever get to something Zep-like. I played the first cut off the record Coverdale/Page, Shake My Tree, for my daughter. She was transfixed. It was here my memory started to finally kick in. “It was interesting when this record came out because it’s a moment of realization for your mother,” I told my daughter. The kids all knew that their mother didn’t want to be married to a touring musician, and that’s okay…I wasn’t really one anyway. It was part of why it wasn’t hard to relegate the guitars to the back room. But my wife also, in the beginning, saw music as a phase, a thing that had little hold on me or little talent holding onto me. 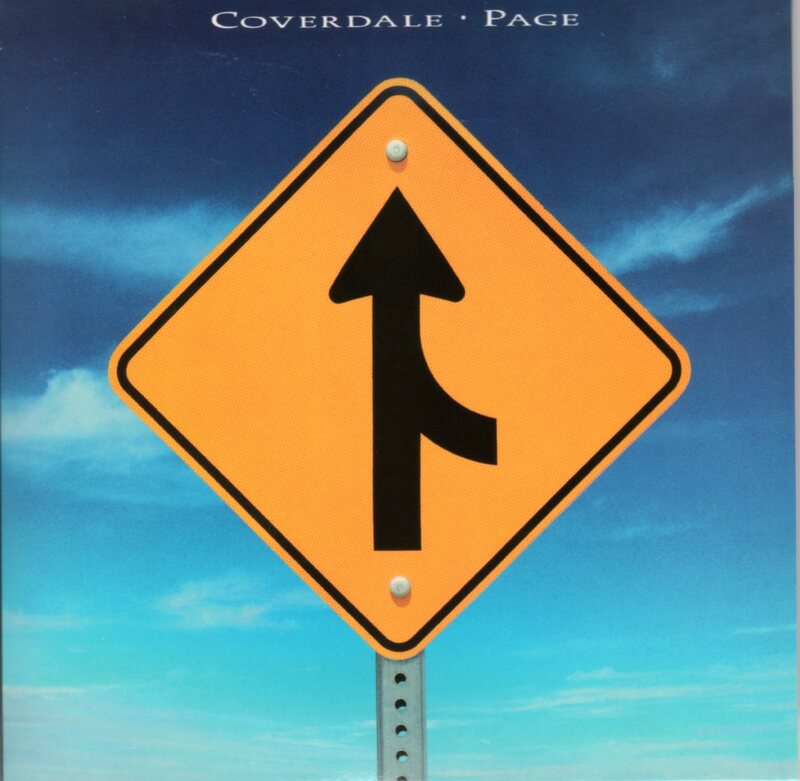 That was, you see, until Coverdale/Page came out. I put the album on and we listened to that first song, Shake My Tree, and when it was over I picked up the guitar I’d just gotten – from her, by the way – a Gibson Firebird. My wife was in the kitchen of our apartment. I started playing the opening riff, that maddeningly fast, sort of off-kilter line and my wife rounded the corner. And she stopped dead in her tracks. “How many times have you listened to that song,” she asked me, her mouth slightly agape. I honestly didn’t understand her confusion. It was a little hard to hit that off-kilter note here and there but once you had the muscle memory, I didn’t think much of it. It didn’t dawn on me – and I swear it’s not ego talking – that it was anything significant. It was just learning the song. Andrea walked over, absent-mindedly put her hand on the back of my head, and said “I just never realized you really could play like that . . . that you could just . . . figure it out. That’s . . . ” (pardon all the ellipses, but it is for effect) she trailed off. She kissed me, full-on, love of my life kissed me. It was a great moment for a musician to know the person he loves now supported something so important in his life. We would have more arguments about music and more conflicts over my playing a night here or making a bunch of money on a Valentine’s Day there…but Coverdale/Page had driven home I was more than just some minor hobbyist noodling around on his guitar. My daughter, hearing the fun story about her mother, no more than an anecdote, smiled and then looked up to see the guide still sitting on the TV screen. Regardless…we still did not watch the Whitesnake concert. I talk a lot about parenting, loss, home all that here. It is no small thing, no subtle metaphor to say that this man was a hero of mine. He was, without question, an icon – a uniquely American form of royalty that spread throughout the world. I grew up with Mr. King playing in my home. His records played all while I was growing up in Nebraska. His 1970’s LP Completely Well was completely worn out. When we would go to the mall and I’d walk out with a Clapton or Van Halen record my father would have a cassette with a live BB King show. We always listened to it . . . and it first. None of us ever complained, either. I went to my first BB King show in high school. 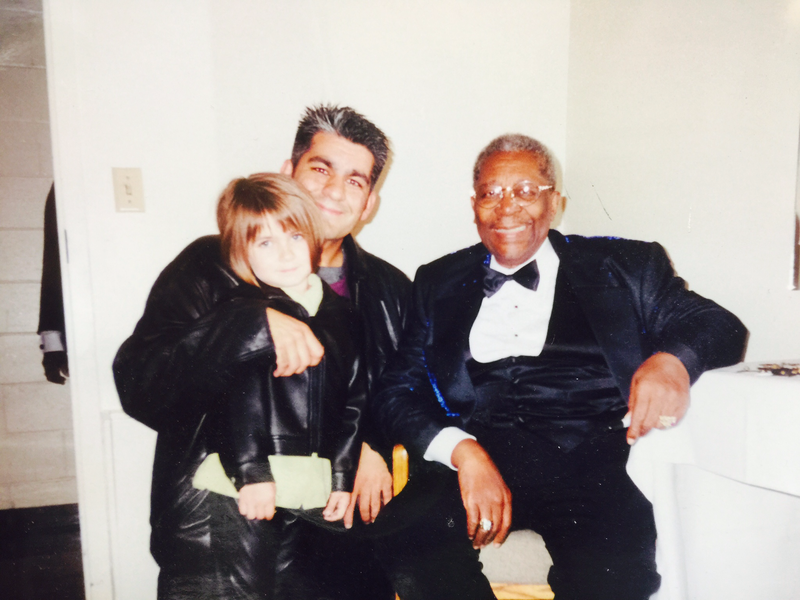 My older brother had procured tickets at Red Rocks Amphitheater and it was a triple-bill: Taj Majal, Stevie Ray Vauhan, and BB King, with BB being the headliner. Taj was good as always. SRV was amazing, but a bit hesitant. We found out later that he’d spent hours the night before jamming with Jeff Beck and worn off his callouses. He’d super-glued his fingers in order to get through the night. 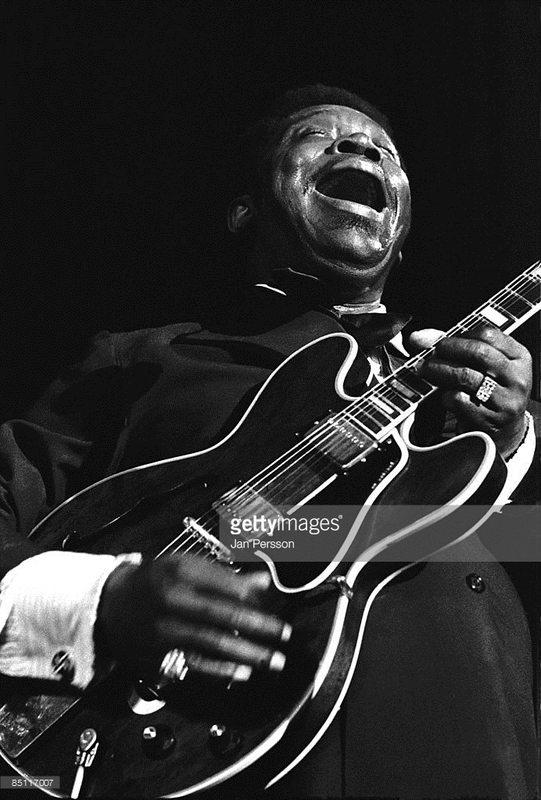 But BB King…the man was just brilliant. Years later I learned to play guitar and it was important to me to learn who the influences of my influences were. When I looked at Clapton, Beck, Green, Vaughan, Allman, they all did songs I recognized. They all recorded BB King songs…but yet somehow, not quite BB King songs. That tone. That crying . . . that singing tone . . . only he could do it. I learned from this master of the instrument and musical mediums (plural, lest you be fooled that all he could do was sing in 3 chords) that one note was all you needed if it was the RIGHT note. You could play 1,000 notes in a single song and he would tell you more by wringing a tone from Lucille than the best of guitarists. When I met an amazing woman who loved me and cared and treated me well I sang her a song one night on stage. In the late 1990’s I worked the phones, pushed, screamed and begged until I got the opportunity – during his tour promoting Riding With the King – to interview him. While he was supposed to give us just 5 minutes in a dark corner, deep in the bowels of Omaha’s Orpheum Theater, the maestro of the blues ushered us onto his bus. He gave us close to an hour there and we did almost a half-hour interview with him. 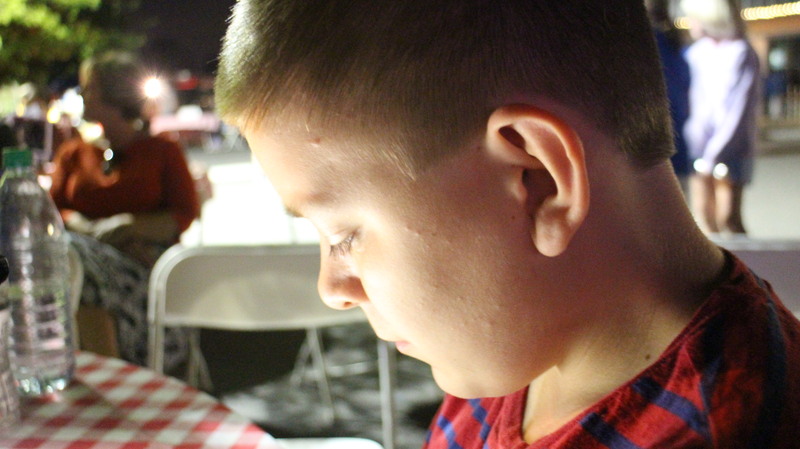 He talked about how he had an incessant appetite to learn as much as he could. He toured with a laptop computer and a library of books he read constantly. My father was unable to come to the show and I asked, rather sheepishly, if I could bring him my father’s worn-out copy of Completely Well and have him sign it. He insisted I bring it backstage after the show. I told King that my daughter asked to see him for her birthday . . . and he insisted I bring her along. My daughter nodded. Her sister was just a baby. “I have a little sister, Hannah,” she told him. King tipped over a cup on the counter, filled with guitar picks and plastic pins. “Grab something out of there for your sister Hannah,” he told her. She obliged. “You probably want something in there, too,” he told her. She nodded. “Well, I’m not going to give you any of that,” he said, a twinkle growing in the corner of his eye. My daughter looked at him, crestfallen but quiet. He pointed to his lapel, where an enamel pin of Lucille hung…gold-embossed with her name on the headstock and his on the pin. “I’m going to give you this one,” he told her. He unpinned it and put it on her collar. My daughter marks the 3rd generation of my family to love this man and his music. For an American King to call her Princess is simply beyond description. We saw him several more times…each time floored by the energy, tone and warmth this man projected. When I put the phone down tonight I could only think . . . a beautiful woman is silent tonight. Lucille cannot cry, she cannot wail, she cannot shout for joy. She cannot sing. The man who says his only love is Lucille left her behind, and she will be silent. But for years they made music together, sang together, were sad and angry and sarcastic…and joyous. And what an amazing body of work they left us. Don’t you know you’re riding with the King! It could easily have been a stressful and exhausting weekend. My sons turn twelve this week, twin boys with dissimilar tastes and lots of bright ideas for birthday presents and no real clue how much the things might cost. Still, they’ve never complained if they know the gift they want is too much and this year they didn’t really ask for much. 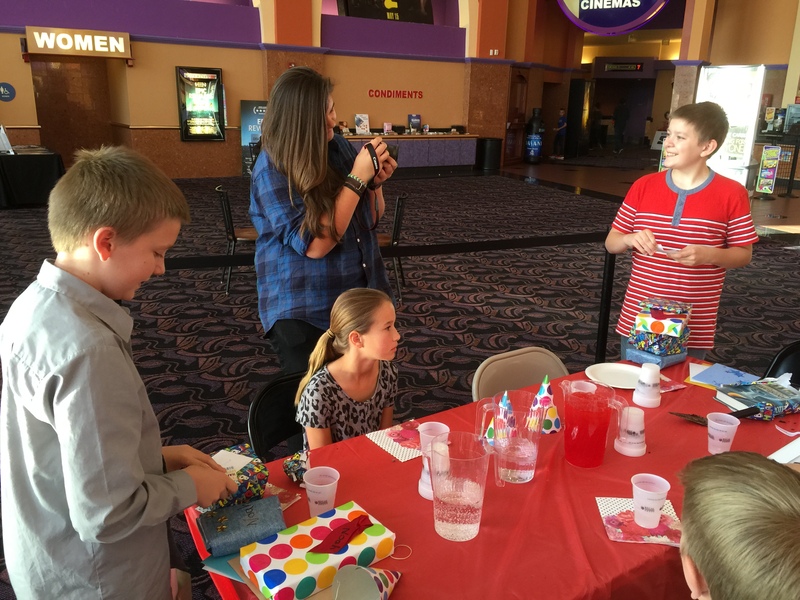 I learned, after years of attempting to do birthday parties at home, that it’s cheaper, easier and cleaner to do the party at a place that handles the cleanup for you. So this year we went to the local movie theater. It wasn’t a complicated movie. No superheros, no explosions. (Well, a couple). We saw the movie “Home”. It was cute, if a bit vanilla at times, but it did the job quite well. Where I’d normally make a cake from scratch I ran out of time so a local bakery substituted just fine, thank you. Salted caramel chocolate cake is a great substitute for Dad’s Devil’s Food one. Plus it looked nicer. We ate pizza, opened presents, had cake, sang “Happy Birthday” and walked off to home and play the videogames they’d gotten as presents. The day after was the interesting one. While the boys went to a friend’s house, after their party, my middle daughter had the first practice for a band she’s been dying to put together for months. The bass player arrived and in true teenage fashion they spent a large amount of time trying to find musical middle ground and get used to being in the same room with each other. It might have been my greatest luck that I didn’t start playing the guitar until I was 19. By then, after being asked to join a cover band, I was itching to play. So the idea that I would spend more time talking seemed a waste of time. “Stop with the words, grab your guitars and let’s rock!” At least, that’s what my memory says. In reality it probably wasn’t too different from my daughter’s day. I was stunned, a bit taken aback. She looked at me like I’d just given birth to a cat or something. It was my turn for a stunned look. My daughter was afraid I was going to criticize her . . . but it wasn’t at all on my mind. It actually concerned me that he thought I was going to go straight to criticism. I was worried she thinks that’s all I do. Once in awhile the little people realize that there’s value in what their Dad says when it comes to past experiences. I need to do a better job, I realized, of expressing that so they don’t immediately think I’m going to criticize what they do. Over the weekend I watched a documentary on a free preview of the Showtime network. I’m not afraid nor am I ashamed to admit that it was on the band Genesis. I know there’s some backlash, particularly since the shift from music in the 1970’s to the 1980’s and today when people have some chip on their shoulder about the band. I’m not sure why, perhaps it was the second lead singer, Phil Collins, having been everywhere from on television to a cop on the film Hook to doing the soundtrack to Disney cartoons. That said, I’ve always liked them, no shame or afterthought to that statement. But this isn’t about them, at least not particularly. No throwback to the 1980’s or melancholy or wishing things were like when I was a kid. Genesis is just the impetus of one of the sweeter surprises I’ve had in some time. The picture up there is from the 1990’s, not long after my oldest daughter was born. She’s the infant in my arms, on a stage, Clapton Stratocaster around my neck, while I have long hair and look something like a character from the movie Death at a Funeral. My wife took that photo, though I can say I never thought she was particularly pleased to be there. 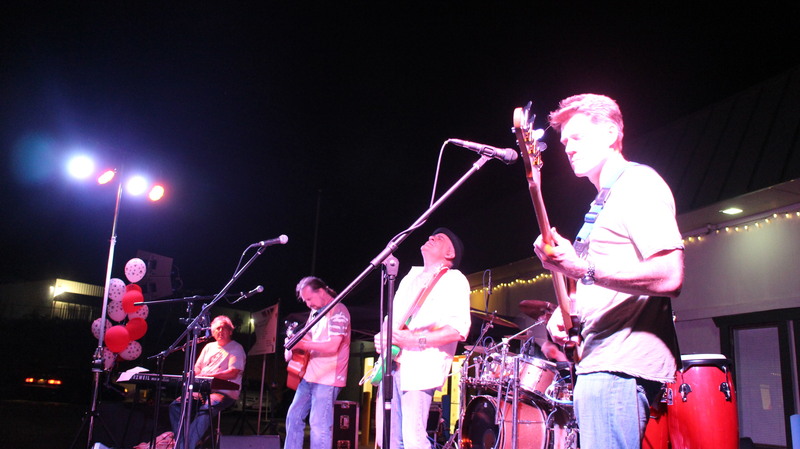 This was my band, with my brother a member, playing at a summer festival in Omaha. My wife had little or no use for my being a musician. It didn’t make a ton of money – which isn’t at all what I was performing for in the first place. It didn’t focus on our relationship or on her, except the couple songs I’d written about her or us. Neither of those was easy enough to pull off live so there was no focus for her. She wasn’t at all convinced this was a good idea. In my defense, I just cannot stop being a musician. It’s in my DNA. It’s like that Stratocaster is part of my left arm and if you removed it I may as well bleed out. I will also argue that there were months, in the bleakest of times when she was in Pharmacy school and I was working two jobs to keep the heat on in our home that we ate due to the gigs I played. It wasn’t a ton of money, but it was money and every dime counted. Watching the Genesis documentary they brought up each of their solo careers. Sure, Phil Collins had one; a stellar one, in fact. 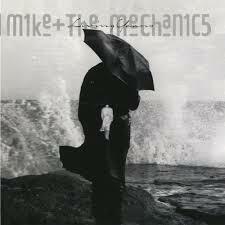 But the guitarist, Mike Rutherford, had a band and still plays much of the time with his own band, Mike and the Mechanics. After a start with one singer they switched to another singer, from the band Squeeze, named Paul Carrack. The album came out in 1988, some years prior to that photo of my daughter and I but it continued to get some airplay. As Rutherford recounted the fact he couldn’t sing and that may have affected his ability to sell the millions of records like Collins, my daughter looked over at me with a smile. “I can’t believe Mom never told you that,” she said, confused. In less than two months it will have been four years since my wife passed away. We had an interesting relationship. Always loving, always friends, and often contentious. Music was part of our lives but not always a part she wanted. I always had a dream, even with 1, 2, then 4 kids of making a living doing it. She never thought that was practical or realistic. But then she’d surprise me. She always did. I never made the connection nor have I ever claimed to be of the caliber that Paul Carrack is. I’ll take the complement, nonetheless. Now, almost four years after she’s gone, I hear that she heard my voice and heard possibilities. I knew her well enough to know that’s what was going through her head. When she’d dismiss recordings I’d make she’d tell her daughter or friends that her boyfriend/husband sounded like Paul Carrack. Should I be mad that she never told me? No. Not a whip. Today I’m sitting home, recording, getting ready to find funds to hit the studio and hire a drummer and bassist to put a full record together. Where I’ve been frustrated trying to get that chord progression right or my computer gives me CPU errors during a take or I just can’t get the lyrics the way I want I’ve been frustrated and silent of late. And then this comes, out of nowhere, blasting through, and I feel a pride I hadn’t known for awhile. Pride in the fact she heard something in my voice, even if she never voiced it to me herself, not in that way. This weekend she said it loud, said it clear. It’s just up to me to listen. People look at a new year as yet another transition. It’s a new year, a new start, a new, fresh outlook. So often, though, we get to June, halfway through the year, and we realize that it’s the same year, just different numbers on the calendar. “New Start” may be a misnomer for some, I certainly don’t feel like January 1st came and suddenly the world shifted on its axis and all life’s worries, problems and realities became clear. As a matter of fact all the problems remain and the realities are just that…realities. It may be slightly different for my kids and I, though. Much like it’s different for others out there, I suppose. Say you lose a parent, or you get a divorce or your spouse leaves you. Happier things change you, too. You have a child or another child. You get a new job or a better job. These are paradigm shifts in your life. My new start came nearly four years ago. I’ve never been one of those to take significance in numbers, but significance in days is something I’ve come to think about. I was married on the 26th of March. It’s also the day my marriage ended when my wife passed away. 8:30am, exactly, she took her last breath. Here’s the thing with that shift, though. The easy, lazy, terribly attractive thing to do would have been to shut down and just let it all fall apart. In some ways that happened here and there. However, in other ways it’s been a trace back to that day that’s become a very new start for all of us. Don’t get me wrong, if nothing more than the mental stability of my children was the reality, I would gladly wish away the grief and the problems it created. Still, the changes that came after that day, four years ago, were a completely new start for me. 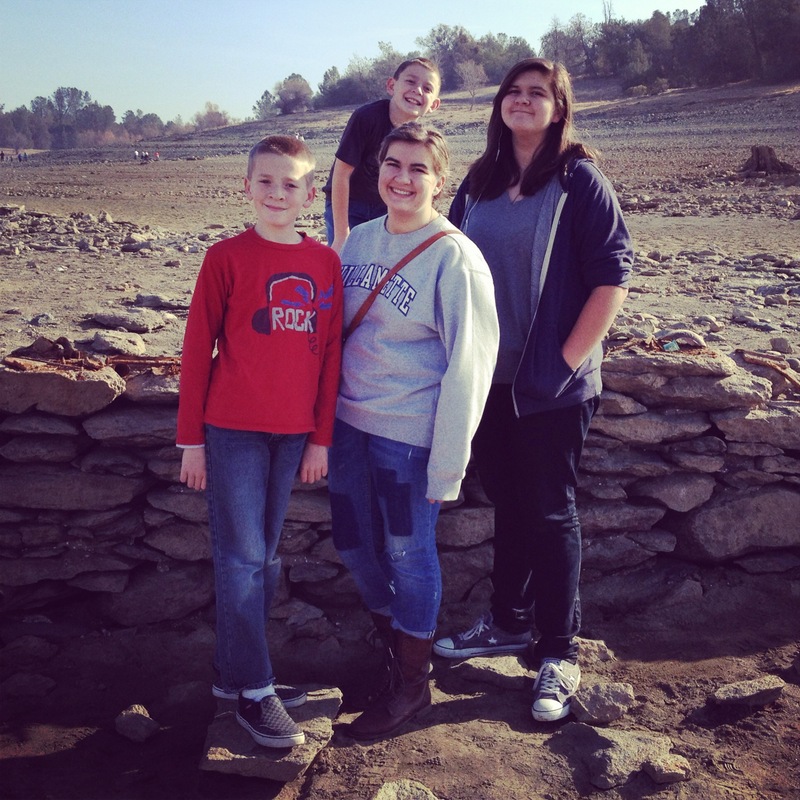 They were big changes for my kids, too, and in many ways we came out for the better. I have a new job, take my family seriously, try to put them first and all the things we do I try to do together. That’s always been the case…except now we try new things. We eat different foods, we travel other roads, we experience things just because we can. It’s not that we didn’t when their mother was here, really. Maybe the whole “life is just too short” mantra rings in our ears, but we do it regardless. I’ve become a musician again, full-force. I was always one, sure, but the guitars were relegated to the spare room, the idea of writing or recording tossed aside. This year is definitely a shift. 2014 saw loss…lots of loss and we weathered it, again, as best we could. We got closer to some people, more distant from others. Still, it was a good year, it truly was. Yet 2015 looks even better. My brother has a record coming out and we’re all excited by that. I hope, pray, and am working toward going into the studio myself this summer. If I can pull that off some of the best material I’ve written in awhile will be laid to tape and I’ll be pushing you all to give it a listen. More than anything…it’s been four years of changes and adjustments and I couldn’t be prouder of these four little people who are in my charge. They all stick together, band of brothers and sisters, and follow me when I charge into the unknown. They never wavered in their trust of their Dad. 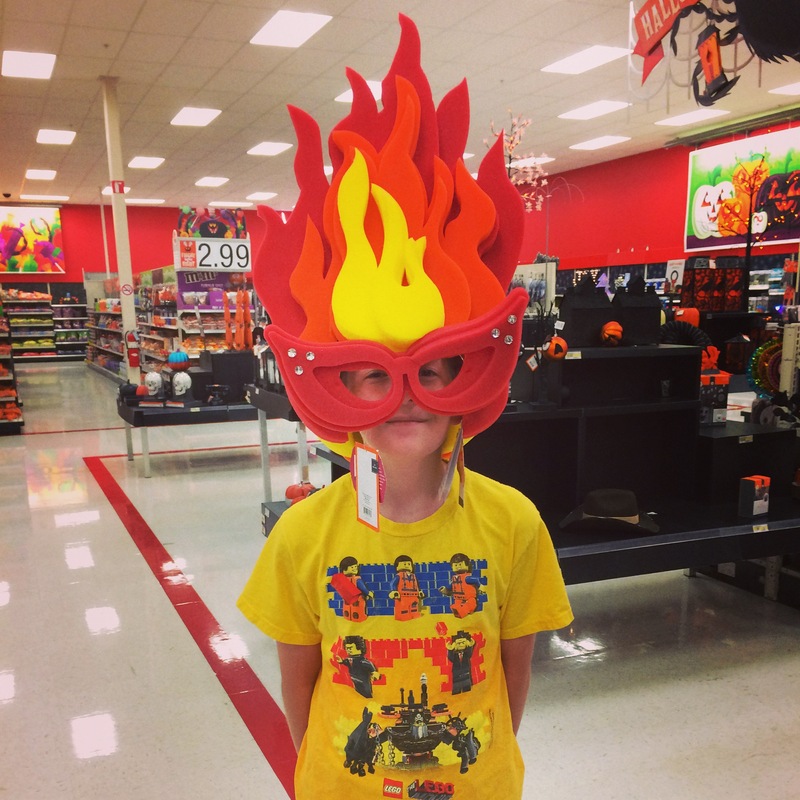 Four years ago I also took the mantle of parent – only parent – and rode off into the dark quagmire that is single parenting. What we created was a new, unique, quirky, sometimes snarky and sarcastic world that outsiders may think is strange and odd. But then, others think it’s odd that we can be so happy when we’ve lost so much. What they don’t see is that losing so much does actually make you appreciate when you have so much left. Yes…it’s a change. But then sometimes, a change will do you good. I always go all-out at Christmas. It’s a habit, perhaps a poor one, but a habit nonetheless. The last many years that habit has been one where I give and never really think about receiving. It’s not a bad thing, more end-of-Christmas-Carol Scrooge than “Humbug” Scrooge. 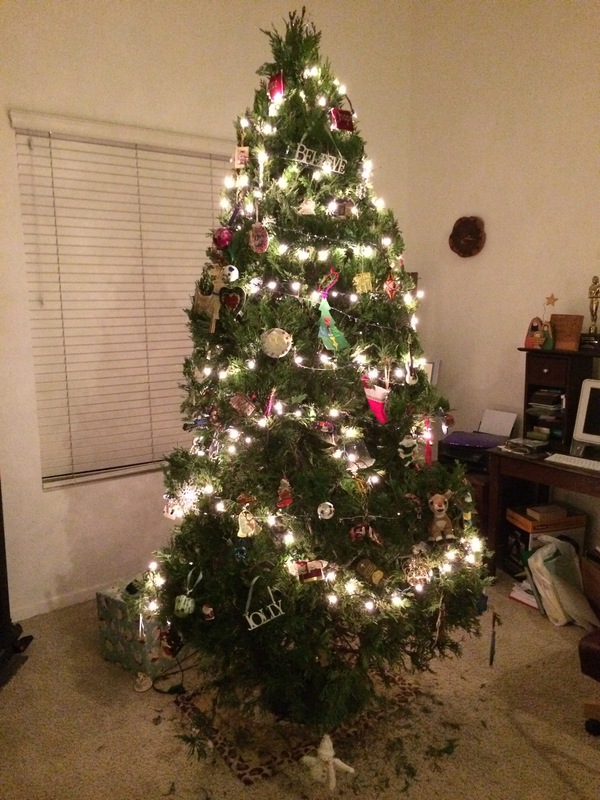 This year, though – and I promise, I made no allusions toward complaint or statement about getting no presents – my kids and others humbled me beyond belief. I made a thousand treats throughout the last couple days. I had a full cake I made; there’s homemade sugar cookies; there’s caramel fudge bars; there’s giant chocolate chip cookies. Then my dinner came with my late wife’s sister and her family. Ham, potatoes, corn and she brought rolls and wine and beer. You know, the essentials! But as much as I prefer the season being about my giving . . . not getting gifts, I must share what was some of this year for me. The gifts I received. I got a gift from a friend and colleague that had the sweetest of cards and tons of treats and made me feel uniformly special and guilty that my gift for them was nowhere near as great. Another colleague gave me an entire case of coffee to replace the small box of Peet’s Kuerig cups someone stole from our office at work. While that may seem more a fun gift than “gift” it’s not. We live off caffeine. 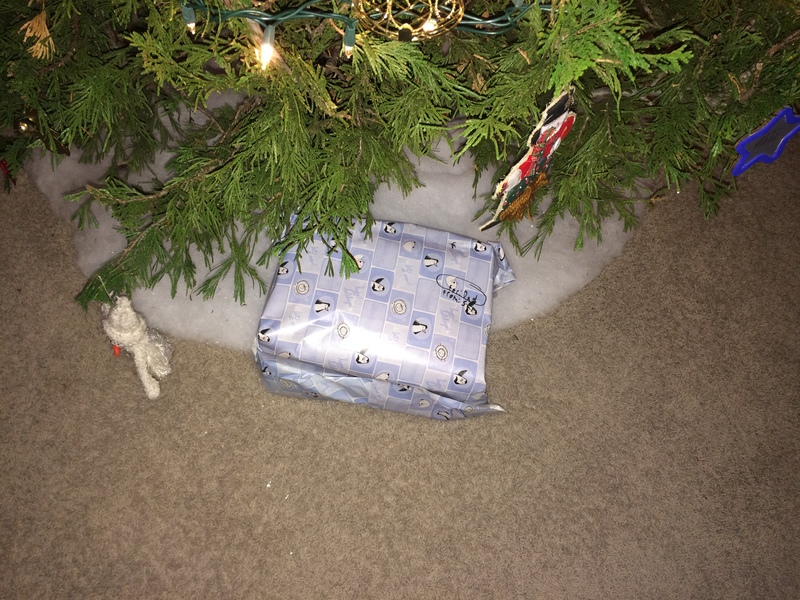 My son took great pride in having the first present under the tree this year. I was so happy because he was smiling, proud, and overly excited. No talk about new video games, no thoughts about what he really wanted . . . he simply grinned looked at me and said “it’s for you Dad!” In that present, one of my favorites, was a 2015 calendar he had made for me. It was 12 Biomes of the World, all drawn by him. I will hang it at my desk and use it proudly. He’s had it hidden somewhere in our home for months just waiting to give it to me for Christmas. My other favorite was from my oldest. She knows me well. Exceptionally well. 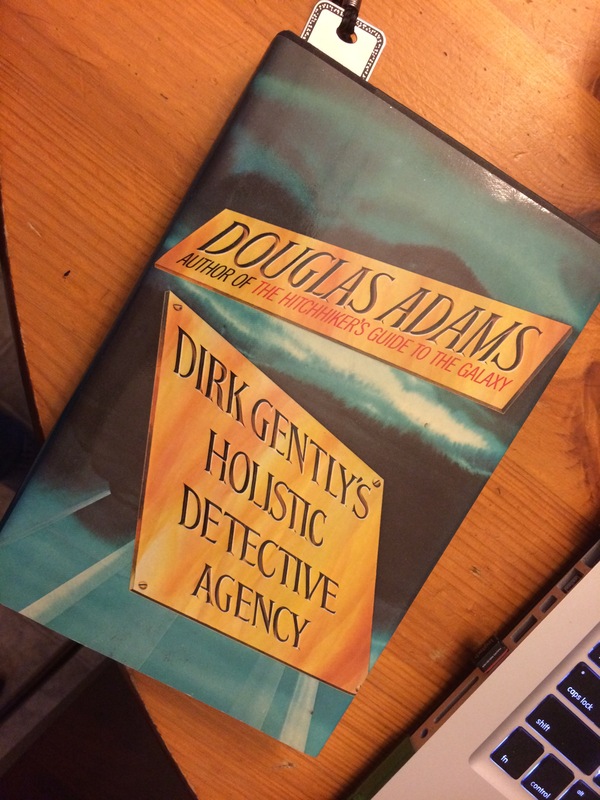 Douglas Adams’ Dirk Gently’s Holistic Detective Agency was the series he wrote after The Hitchhiker’s Guide to the Galaxy. I’d never read it and looking at the yellowed cover I knew what immediately came out of her mouth. The general consensus was this was a most excellent Christmas. That wasn’t because it was filled with presents, we didn’t have any larger a gifts than last year, I don’t believe. This just felt Merry. I know that’s cheesy, it’s the word for the season, but past years were good, just not as joyful as this one. Yes…I was completely exhausted. Over the course of 3 days I made a salted caramel peanut butter fudge pie; I made a chocolate brown sugar butter cake; I made sugar cookies; caramel fudge bars and chocolate chip cookies. Then the dinner. I did it for one simple reason. This is what my Mom, my Grandma, her mother . 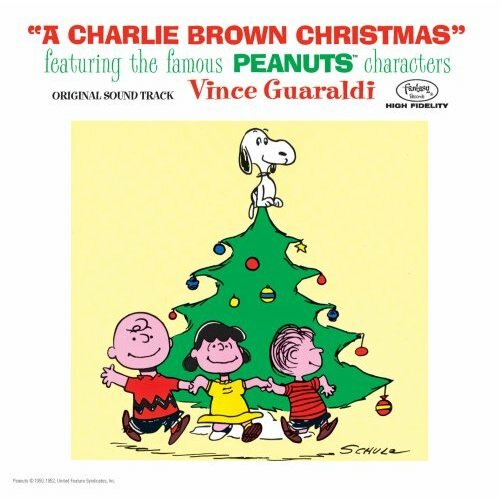 . . this is Christmas for my family. You make the house smell of homemade cinnamon rolls (did I mention I made those for Christmas morning?) and baking bread and cookies and . . . it’s magical. With so many years of struggles to find calm and peace and wonder in the day . 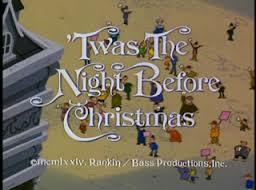 . . it was pretty cool to look up at the end of December 25th and realize we hadn’t felt sad or melancholy, there were so many laughs and music (my nephew got a guitar so I taught him some chords) and love. And we didn’t even need an electric monk to believe it could happen for us.